Manor ISD would like to feature some of our outstanding educational partners that help our students become successful, productive citizens after high school. This month, we would like to spotlight our new partnership with Code2College. 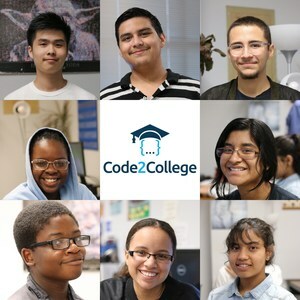 Code2College is an Austin-based nonprofit focused on increasing the number of traditionally underserved students (underrepresented students of color, low-income students and girls) who enter STEM undergraduate programs and careers by leveraging tech company volunteers as after-school coding instructions and mentors with local high schools in the Austin area. This school year, Code2College has added Manor ISD as a district partner and has been working with over twenty Manor High School students, teaching them a variety of programming languages including R and Python. In addition to attending after-school coding sessions, students have been able to participate in professional skills workshops held at local corporate offices including RetailMeNot, Silicon Labs, and Facebook. Top students from the program are eligible to participate in a paid summer internship at one of the organization’s internship host partners where they can earn over $5,000 and valuable work experience. To learn more about Code2College, visit them at their website or follow them on social media @Code2college.